Review by AllTheBestFights.com: 2016-12-30, good performance by both boxers: Akira Yaegashi vs Wittawas Basapean gets three stars. The world champion in three different weight classes Akira Yaegashi entered this fight with a pro boxing record of 24-5-0 (12 knockouts) and he is ranked as the No.4 light flyweight in the world (currently the #1 in this division is Ganigan Lopez). He lost two consecutive bouts in 2014, against Roman Gonzalez (=Yaegashi vs Gonzalez) and Pedro Guevara (=Yaegashi vs Guevara), but then he has won four fights defeating Javier Mendoza (=Mendoza vs Yaegashi) and Martin Tecuapetla in his last two (=Yaegashi vs Tecuapetla). His opponent, Samartlek Kokietgym (also known as Wittawas Basapean), has a record of 31-5-0 (12 knockouts) and he entered as the No.56 in the same weight class. He suffered his last loss when he faced Naoya Inoue in 2014 (=Inoue vs Kokietgym), since then he has collected 14 consecutive victories beating Samuel Tehuayo and Tommy Seran in his last two. 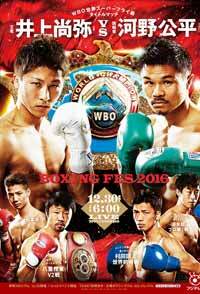 Yaegashi vs Kokietgym is valid for the IBF World light flyweight title; undercard of Naoya Inoue vs Kohei Kono. Watch the video and rate this fight!